My love of Wales has often crept into this blog, and this week reappears as we visit the north of the country, a breathtakingly beautiful area of the world. I was there late last summer, travelling with friends, enjoying landscape and coastline, a selection of good pubs, good company and – of course – a bookshop. 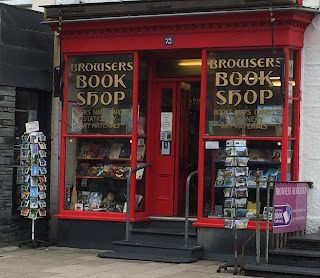 Browsers Bookshop is found in the town of Porthmadog which, for those who don't know the area, is very close to Snowdonia National Park The town is also home to a steam train, which later took us through a good amount of that beautiful countryside as we continued with our travels. If you get the chance to incorporate the Ffestiniog & Welsh Highland Railway into your journey I urge you to take it. Anyway, back to Browsers. The bookshop is deceptively large, with the warm red shop front taking you back through rooms of books until you reach a room of cards and art materials. The first room contains 'readioactive' material and bookcases are labelled according to their subject, including sections for Wales, the sea, and science. Classic novels are nicely displayed in alphabetical drawers and there are well-stocked audiobook and secondhand areas too. Children and young adults are also very well catered for. 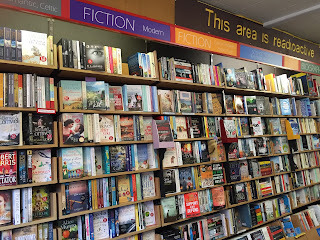 Fiction at the front of the bookshop is plentiful and well signposted to suit different tastes, meaning browsers could easily pick a mood and contain their search to its respective area if they were in a hurry. As I was taking my time, I dawdled, enjoying the buzz of people before approaching the bookseller, who recommended The Dig, by John Preston. 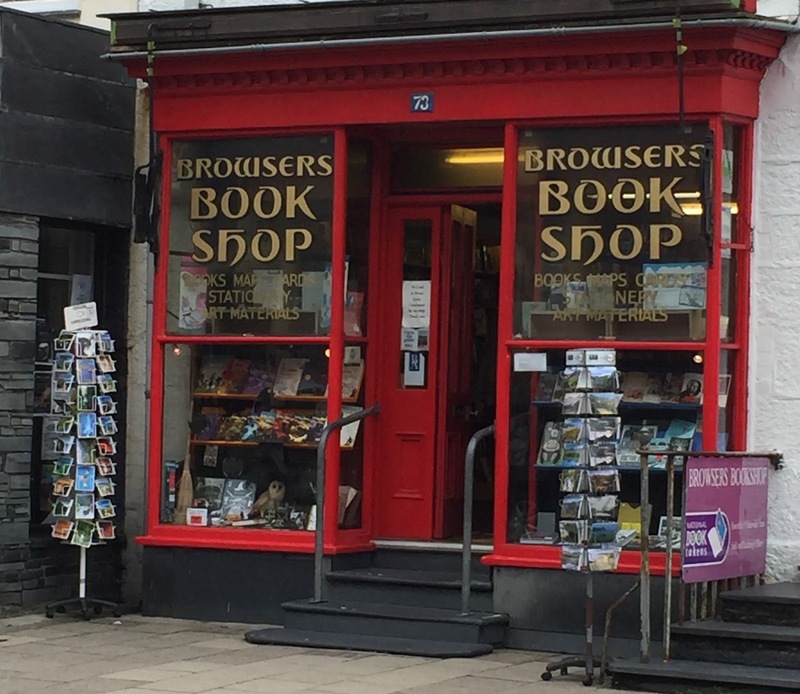 Browsers Bookshop has been run by one family for more than 40 years and during the course of our conversation I had the pleasure of hearing more about a life in the bookshop and plans to pass the business on to the next generation. If the future is even half as friendly and welcoming as the present this is very good news for town's readers. Given my love of all things bookshop, it may surprise you to read how slow I can be to visit certain key points on the book-buying map. In the case of this week's bookshop it's a particularly big omission on my part because I have to confess I only visited Europe's largest bookshop for the first time last year, and then only because it was part of an organised bookshop crawl. This wasn't because of any kind of deliberate avoidance on my part, it's just that other bookshops had come to my attention and let's be honest, this one probably doesn't need any publicity to bring it to people's attention. Waterstone Piccadilly proudly overlooks a busy shoppers' paradise in London, it's in a prime location, has entrances at two sides and is packed with so many eateries even non-booky people (do they exist?) must be tempted in to escape the crowds. Well, to escape the outdoor crowds, the bookshop is hardly the quietest of places. I was there with the first ever London Bookshop Crawl, so we were a crowd in our own right, but the place is so full of people that we were no more noticeable as a group than any other shoppers. We also quickly dispersed throughout the bookshop's six floors. 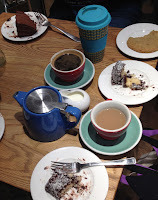 But I'm getting ahead of myself, first we had cake. 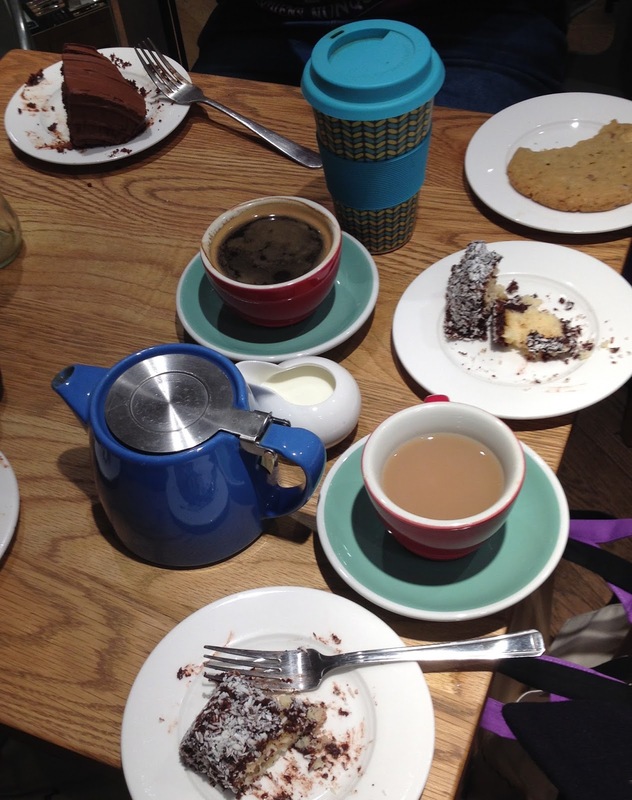 The agreement was to meet in the bookshop's cafe, making the most of the chance to give our feet a rest and re-fuel with tea and cake. An easy plan to execute in most bookshops, but not everyone made it because there's more than one cafe and a restaurant/bar – how do you know the right one to go to? 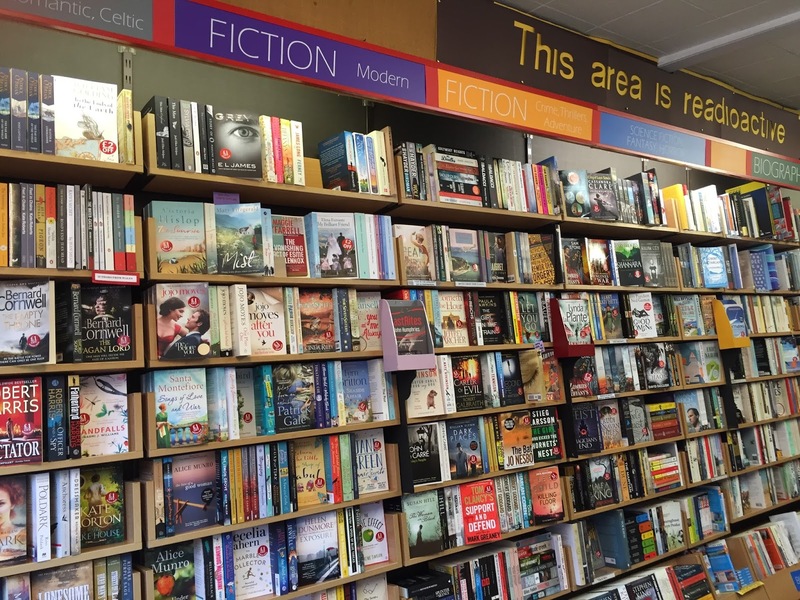 Which is any easy question to ask about the whole bookshop – with something like eight miles of bookshelves to browse how is it possible to work out where to start? For many, I'd guess the answer is to stay on the ground floor, where the bestsellers and new releases are so plentiful a browser in a hurry may easily find a book or five to meet their needs. This is where my purchase came from before I'd begun looking at the shelves, when fellow bookshop crawler Katie insisted I – and several others – buy Becky Chambers' The long way to a small angry planet. She was so enthusiastic I couldn't question her recommendation, and having since read the book I can only repeat her encouragement. Having my purchase in hand before exploring the bookshop possibly felt a little like cheating, but it did mean I was able to gently wander, taking in the atmosphere without looking too closely at the shelves and so saving myself from the danger of buying the equivalent of a small library in this one shop. The temptation is everywhere and with such a large number of books on display I imagine it's impossible to leave empty-handed. The bookshop is well laid out, with large areas of comfy sofas on every floor and clearly marked sections and help desks for ease of navigation. The children's area was particularly colourful with baskets of cuddly toys I could've happily dived into (although perhaps parents won't appreciate quite such a large temptation for their young?). 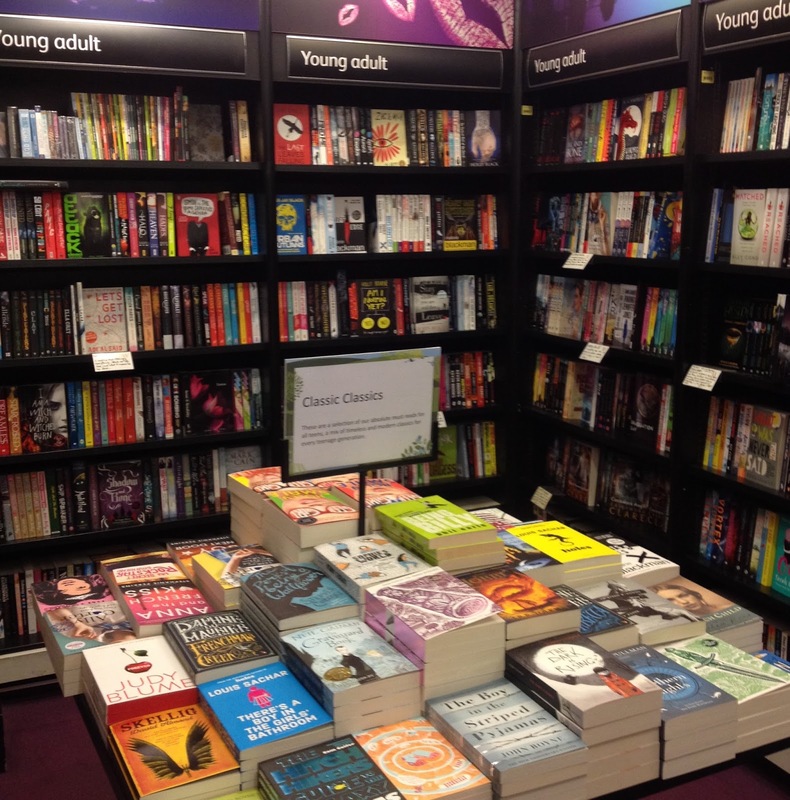 I also loved seeing swathes of shelving dedicated to independent publishers, young adult and historical fiction, among others, as well as various stand out displays for favoured (by me) books that wouldn't often be seen promoted in your average smaller branch of Waterstones. This included a whole table of Masterworks sci-fi, I always enjoy spotting their yellow spines in bookshops and if I hadn't already found my purchase I'm pretty certain this table would've forced me to buy more than one of its offerings. As an added point of interest, Waterstones Piccadilly is home to the Russian Bookshop. This takes up a large chunk of the fourth floor and is worth a visit even if you don't understand the language, simply for the experience. I may not have bumped into any oligarchs, but I like to think this is where they'd hang out when not busy managing their empires. 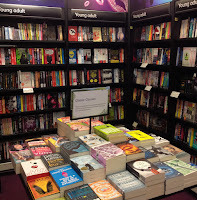 The area was certainly classy enough, but still familiar enough to not scare off an inquisitive bookshopper. Overall, Waterstones Piccadilly is a huge book store, with more titles than anyone could even dream of reading in a lifetime. It's a great place to explore, hunting down genres you might not usually encounter and I defy anyone to visit without finding at least one book they want to buy, however should the bookshop somehow fail you (unlikely), there's also cake. If you plan on taking a walk along Albert and Highland roads in Southsea, Portsmouth, my advice is to take a good strong tote bag or two. And be prepared to leave with a lighter wallet. The road is packed with independent shops of a varied and interesting nature, and many of them are bookshops. I was there with Abbie Headon, who I've mentioned before, and time was late and limited so we weren't able to go in all the bookshops, but even peeking through the windows was enough to see shoppers are spoiled for choice. We started our journey in Jade Mountain Bookshop, a lovely little secondhander that's entered through the same doorway as a cafe, should you need to fuel up before you start shopping. The bookshop is crammed with all manner of gems, ranging from a glossary of tap dancing terms and a guide to line dancing to the more standard offerings of general fiction – not forgetting Ladybird books and a good selection of orange Penguins. It's slightly untidy, but in an organised, loved kind of way that makes it charming, and a brief conversation with the bookseller left me certain he knew the location of every book in the room. In fact, I'd suggest a chat with this bookseller is an important part of any visit, as he talked about his love of the bookshop and the reason for its rather unusual name – which is based on the initials of the previous owners and has nothing to do with a Chinese takeaway. We'd not needed help when browsing because we'd enjoyed diving into the bookcases and piles, searching for tempting titles and delighting in unexpected discoveries – I found Joseph Heller's Something Happened and a sweet little book about the Tea Ceremony. They were so reasonably priced it would've been rude not to buy both. I loved Jade Mountain Bookshop and was sorry to leave, but other bookshops awaited and time was passing us by. As it happened, time had already passed us by, and the lateness of the afternoon meant many of the bookshops (as we walked along Highland Road and it became Albert Road) were already closed for the day. Many also are not mentioned on Google, so all I can tell you is that there were lots, including a rather appealing graphic novel and comic shop that I did manage a quick look around. Thankfully, not all the remaining bookshops were closed, and as we arrived at the opposite end of the street we found crime specialist Adelphi Books. At first glance this is not a bookshop for the fainthearted, but go beyond your first impression and you'll see it's also somewhere special. The initial doubt is because the place really does look to be in a bit of a muddle, with some books apparently forgotten on the floor, but contain your browsing to the shelves and you see a wealth of secondhand titles unlike any standard high street crime section could offer. Which is a real treat. Stock is for those who read further back than today's popular writers and I wouldn't be surprised if a few original prints of British Library Crime Classics could be found among these shelves. We were particularly taken by the Toff series by John Creasey and in the end The Toff and the Runaway Bride had to be my book of choice. Exploring the bookshopping delights of Southsea was a pleasant way to spend a few hours, even if we were often limited to looking through windows. Should you decide to take my advice and go for a wander, I'd encourage you to arrive early because the internet is little to no help here. Instead just take a chance – even if you only get to these two bookshops your efforts will not have been wasted.